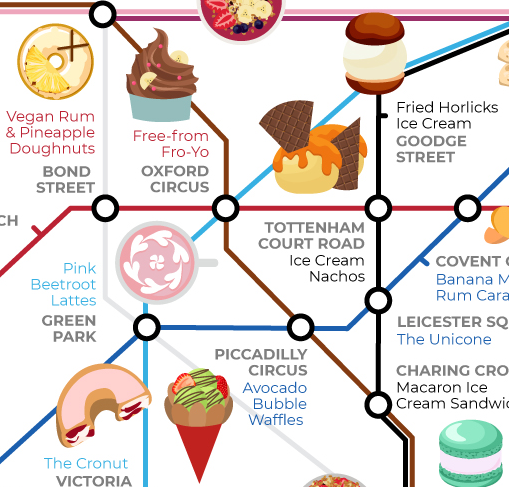 From cronuts to bubble tea, to avocado-flavoured...well, anything, really, London's never short of a shiny new food fad. But, in a city this big, where do you go to find the latest culinary creations taking the city by storm? 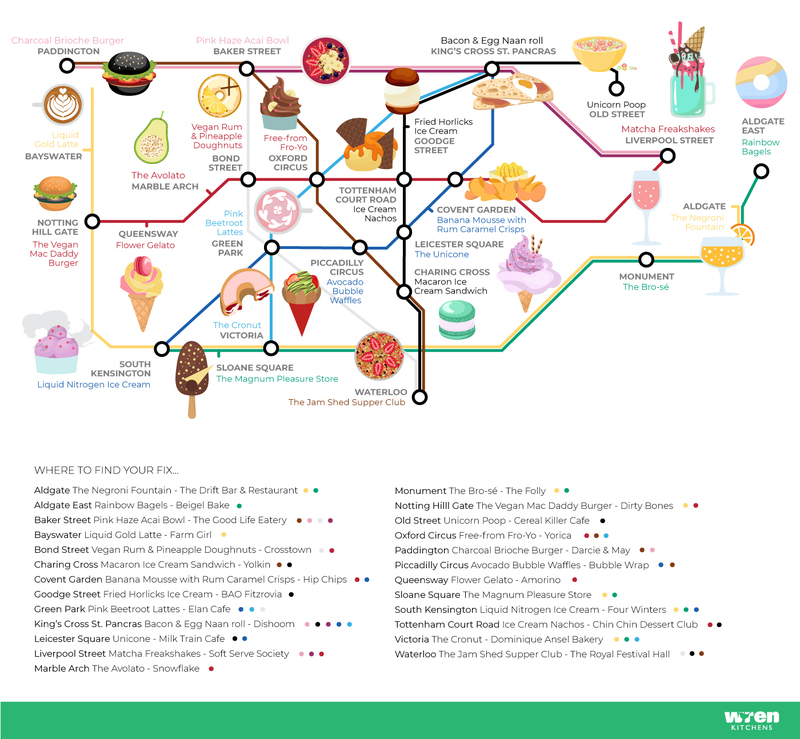 Wren Kitchens has rejigged the tube map to show you where to find the weirdest and most wonderful grub in Zone 1. 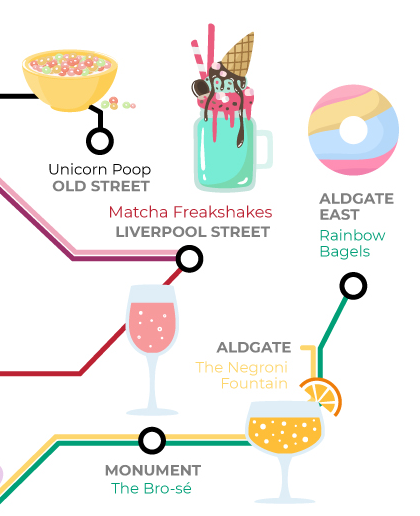 It's something of a technicolour dream for foodies in the East End, with Brick Lane institution Beigel Bake offering rainbow beigels, and matcha freakshakes on the menu at Soft Serve Society. Meanwhile, hipster fave Cereal Killer cafe is offering the somewhat ominous-sounding Unicorn Poop (which we tried back in 2017). Moving more central, we've got fried Horlicks ice cream (presumably to give you one last sugar high before putting you to sleep) from BAO Fitzrovia, and Bubble Wraps' avocado-flavoured bubble waffles, which cannily combine two culinary trends in one. There's also millennial pink lattes, and the mother of all food fads, the infamous hybrid confection that is the Cronut. If savoury snacks are more your thing, go west for Bone Daddies' Vegan Mac Daddy burger, or Darcie and May's meaty charcoal offering. From there, it's just a hop, skip, and a jump along the Circle line to Dishoom for a bacon & egg naan roll, the ultimate hangover cure. See all of the goodies they've mapped over on the Wren Kitchens blog. If nothing else, you're bound to garner a few likes on the 'gram. 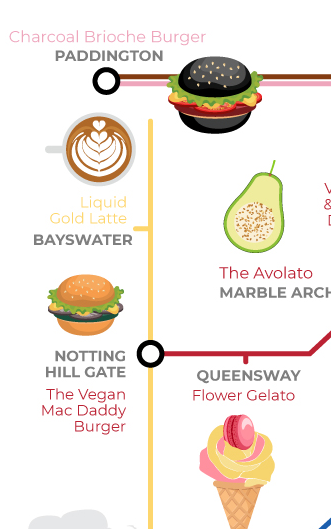 If that's got your appetite going, check out our baker's tube map — next stop, Mornington Croissant.